1950’s Broadway audiences backed away from The Golden Apple. It was all Greek, all intimidating Classical Greek, to them, they reasoned, even if it was sung in English. It didn’t follow the era’s conventional format for successful musical theatre. Never mind that the critics praised it highly with almost unanimous voice. Never mind that it was the first Off Broadway show to transfer commercially to Broadway. Never mind that it won the coveted Drama Critics Circle Award for Best Musical in 1954, the first Off Broadway show to achieve that honor. It closed at the Alvin Theater after only 125 performances. No one has ever recorded its full score; Alfred Music finally published the complete piano-vocal score in 2009. It’s never had a Broadway revival or a major London tour. 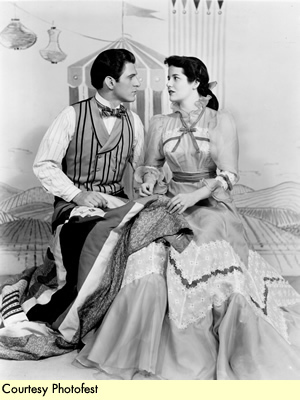 It’s had occasional productions across the US in the sixty years that have passed since it opened on Broadway (20 listed on the official www.moross.com website, including concert versions and university-based). Amazingly, it has its own designated Facebook page called “Guardians of the Golden Apple”, with members from across the country. Opening Friday October 24, 2014, Lyric Stage presents The Golden Apple in its first fully orchestrated production since its 1954 Broadway debut, with direction by Stefan Novinski and musical direction by Jay Dias. Consider this: Lyric Stage’s 36 piece professional orchestra and a cast of 43 well-schooled, top-drawer singers. Are theatre world audiences finally ready to take a shine to The Golden Apple? What is so unique about this musical and who created it? It’s most often described as a “musical comedy opera” in two acts. It turns Classical Greek myth, Homer’s The Iliad and The Odyssey, into a bucolic, gregarious folktale set in the Pacific Northwest, with music that is unmistakably Americana. Bold satirical and lyrical romantic elements abound, joined happily in seamless contradiction. Thoughtful pacifist and humanist commentary weave under vaudeville-style routines and crisp one-liners. Certain songs and scenes poke fun at the “book musical” conventions dominating the 1950’s Broadway venues and yearly awards. Sung through like an opera and all rhymed, it defies pigeon-holing with its giddy entertainment tone; yet it’s still very much a valid work of art with multi-dimensional characters and challenging score. 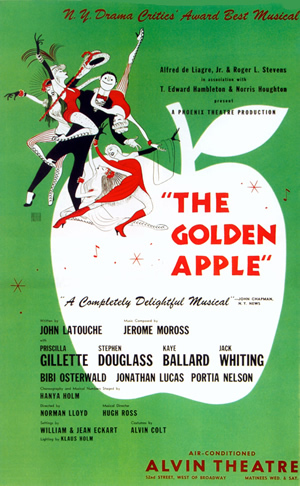 The composer-lyricist team of Jerome Moross and John Latouche began working together in the late 1930’s and created The Golden Apple with the aid of two Guggenheim Fellowships in 1947 and 1949. In an interview with The New York Times, they said their intention was to create a work “constructed as a series of interlocking musical comedy production numbers” that they hoped would “please and at the same time stimulate.” John Latouche was considered a wunderkind lyricist on Broadway and collaborated a number of times with composer Moross before early death at age 41. 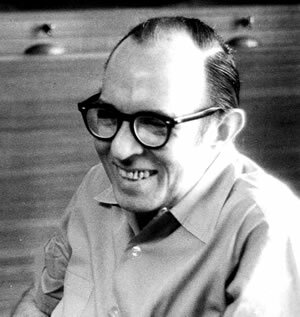 His body of work includes providing additional lyrics for Leonard Bernstein‘s Candide in 1955. It’s Jerome Moross’ score that drives the musical and sets it apart from the conventional Broadway shows of the era. What do you remember about your father as a composer and him working on this show? I was born in LA and we moved back and forth between there and New York City, depending on what my father was working on. He always worked at home or in the studio in Hollywood. I was 14 when the show was mounted on Broadway. I don’t think I knew then how special The Golden Apple was. It was just normal to see my father at work on his scores. This was the second show he and John Latouche wrote together, Ballet Ballads being the first. My father had an older piano that wasn’t in the best shape. He had always dreamed of having a Bosendorfer piano, but never got one. Did the McCarthy Persecutions in Hollywood affect him? No, never. First, he wasn’t that high profile. Second, my father was devoted to his music. He was never a joiner of anything, not the Communist party or anything else. Who had the idea for the show and why this subject material? I don’t know which one of them proposed the idea! I think he and John Latouche conceived it together. My father was an extremely well read person, a voracious reader and very focused on composing works that reflected the American spirit and culture. It would have seemed natural to the two men to re-set Homer’s The Iliad (Act One of the musical) and The Odyssey (Act Two) in an American setting with a folktale flair. It wasn’t that long after WWII. They wanted to make a statement about war and peace; this vehicle was ideal. And then they had so much fun injecting the humor. The characters Scylla and Charybdis are parodies of the 1920’s Broadway and vaudeville comedy double act Gallagher and Shean, for instance. And they wanted to create something unique, not the standard musical theatre fare. How did you connect with Steven Jones at Lyric Stage in Irving? He told me he’d wanted to mount the show for many years. And then when I found the Facebook page “Guardians of the Golden Apple” I learned he was actually doing it. So, I’m coming! I’ve seen any number of the productions over the years. What was the problem with the final song? This goes back to the original Off Broadway production. 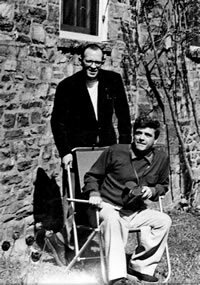 My father and John Latouche wrote the show to end with Penelope and Ulysses’ duet, “We’ve Just Begun”. Some critic declared a musical could not end with just two people on stage, that it should be a big cast number. The producers insisted on adding a full cast reprise when the show moved to Broadway. In 1977, my father put the original ending back on. That’s the version that Lyric Stage will perform. What do you hope the audience will take away from the show? Over the years I’ve attended productions of The Golden Apple I have noticed that singers who knew nothing about it before fall in love with the show once they perform it. I hope the audience does, too. And I hope they enjoy its humor; John Latouche was a brilliant writer and a really witty man. The Golden Apple runs from October 24 through November 2, 2014 at Lyric Stage, in the Irving Arts Center’s Carpenter Performance Hall, 3333 N. MacArthur Blvd, Irving, Texas. Really curious to see the original ending Moross wanted! Enjoyed this interview. Of course, I wouldn’t miss this one.